A 7,600-pound elephant named Little Mac places her foot on a rounded orange pumpkin as if to test its strength. The large gourd bulges a little. Then, she steps on the pumpkin, and it explodes with a crunch. Her audience at the Santa Barbara Zoo cheers. As Thanksgiving was being celebrated Thursday, Santa Barbara Zoo staff decided to treat their animals to an autumnal meal — a pumpkin. Alana Roblee 4, was among the crowd of guests watching the two elephants chow down on the seasonal treats. She was raising her hand and asking the elephant keepers questions about Little Mac and Suzi, who are both 46 years old. “I like their big ears,” Alana told Noozhawk. It was her first time at the Santa Barbara Zoo. She traveled from San Diego with her family to spend Thanksgiving in Santa Barbara. 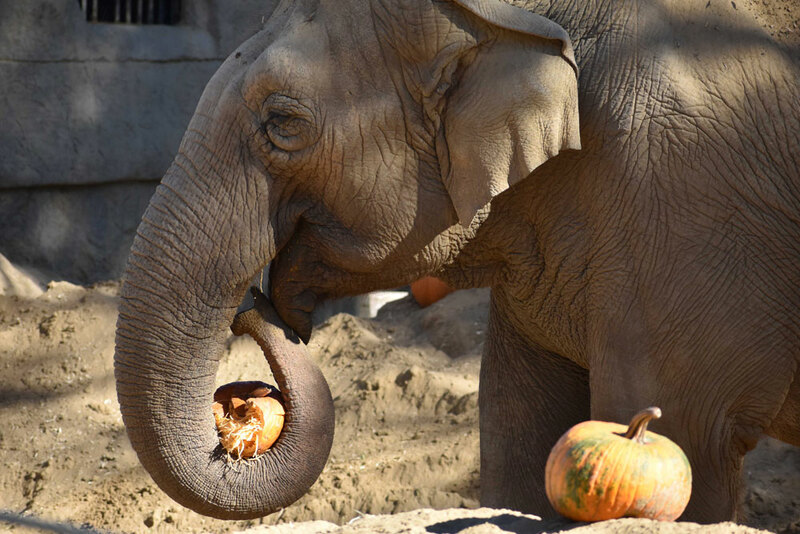 “I didn’t know elephants liked pumpkins,” said Alana’s mother, Kristy. Penguins, a lion, giraffes, toucans, tortoises, gorillas and monkeys were among other animals at the zoo given pumpkins to smash, eat and play with at the annual event.